My favorites are your most formal (#1/2) and your most casual (#7/8)! Going forward, look for lots of strange creative outfits with these pieces, although tomorrow's outfit will add more new pieces to the 30. WOW!!! These are all stunning! I ADORE the cream outfit. You should wear it all the time exactly as it is! You look beautiful. I LOVE all of them. So exciting to see! You are very, very talented. I adore the cream outfit too Joy. So pretty and soft, perfect for the christening. I agree with you about the boots looking too big with that black skirt. Those boots need pants I reckon? Going great guns on your 30 by 30! OMG. Number 1 is flawless. Flawless. You have never looked more elegant. And you are so right about bone being one of your colors. I sometimes wish we could collect WIWs for future reference. I would definitely collect this look and try to copy it. I agree that the boots look too big in proportion to the rest of the outfit in Number 3. But Numbers 5 and 7 are gorgeous. Simple, easy, and yet still so refined. I am greatly intrigued by the use of scarfs by Challenge Participants. I am beginning to think this is an underutilized resource. I am going to start experimenting more with scarfs. Joy, your cream christening out fit is heavenly! Absolute perfection! Your other outfits a beautiful, too. I really like the burgundy skirt with the booties. I don’t think your feet look big. I wonder wearing burgundy tights might be a solution. Comfy elegance! Your color palette is so flattering on you. Wow, winter white is so special(nr 1-2)c I actually loved the edge added by the boots in nr 3-4! Thank you each for your comments and suggestions. The bone/cream outfit had a high happiness factor. I am glad you liked it. Finding this shade of white was a happy accident, and it mixes well with other whites and light neutrals. For this challenge, I will be experimenting with pairing it with darker neutrals and colors. Jenni, those burgundy boots are definitely better with pants. Mainelady, burgundy tights are a good idea. I will have to look for some. Sterling and Katerina, you made my day! Thank you. Sterling, I think that you would enjoy using scarves. There are many sizes, shapes, and fabrics. If one seems too fussy, try a different fabric. I often copy photos of outfits for future use but need to learn to put them in an album as they get lost in general photos. Coming late to this, but wanted to add my applause for the christening outfit especially. I can't wait to see what else you do with these pieces. I agree re: the boots, they are more made for pants to my eye (or maybe a short skirt?). Would the skirt work with the Munro flats? They both look asymmetrical in a similar way. Thank you, Sarah. Yes, the Munro flats work well with the skirt. I should have worn them but use a shoe horn to put them on and did not have it handy. (Reminder to chain it to my closet bench). Beautiful outfit for the christening, Joy! I love all of it--the cream, the layers and textures, the silver shoes, and your gorgeous scarf. I have a fair-trade scarf very similar to yours from 10,000 Villages. I usually wrap mine as you did in 3 and 4, but I also like how yours looks in 5 and 6. I'm going to try that with mine. Rock on with your 30 x 30! More love for 1/2! You are perfection in that. And I agree that the burgundy boots need more "leg volume" - your slim ankles don't have enough visual weight to offset. 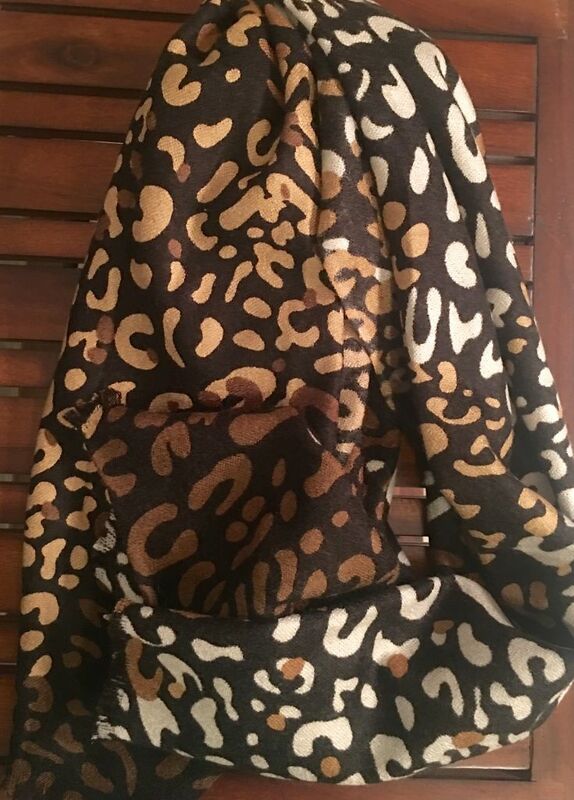 I'm going to study your WIWs for scarf ideas - I have not been a frequent wearer - they often feel "too much" on me, but I love the way you wear them so effortlessly. I may just need to find a JFE ( or at least more flattering) way to wear them. Oh Joy, you look absolutely scrumptious in these outfits. I'm not sure I've ever used that word to describe clothes before, but it jumped into my head, esp at that Christening outfit. I love your tonal reds as well. I love that my outfit evoked the word " scrumptious "! You are right that I have other footwear options. Today I am repeating the leather skirt, but this time with tall dark brown riding boots. ( photo 1) Much better, I think. Day 10: I am adding an olive pullover merino sweater. This outfit got lots of compliments and happiness was high. What do you think? Does the scarf work to pull the colors together? Are the boots ok with this skirt? AGAIN. I love it. You don't have just a few outfits that are fabulous (like I do). You manage to make every single outfit perfect. You make it look deceptively easy. And yet .... some element is missing when I try to copy your exact looks. Your color palette is interesting too. It seems you are adding a variety of colors. Yet they all seem to coordinate. Do I have that right? Just a quick note to congratulate you on the christening - and you look so elegant and wonderful in bone. I also love the last outfit - I don't recall seeing you in this green before but it definitely works!! Joy, I think that bone colour is your signature colour. You look sublime. And I love the olive outfit! I want to copy it. I have similar boots. They are perfect with the skirt. Joy, the answers are YES and YES! I LOVE this outfit, it suits you perfectly. You look gorgeous! You have lovely things in your wardrobe and you create absolutely fabulous outfits. 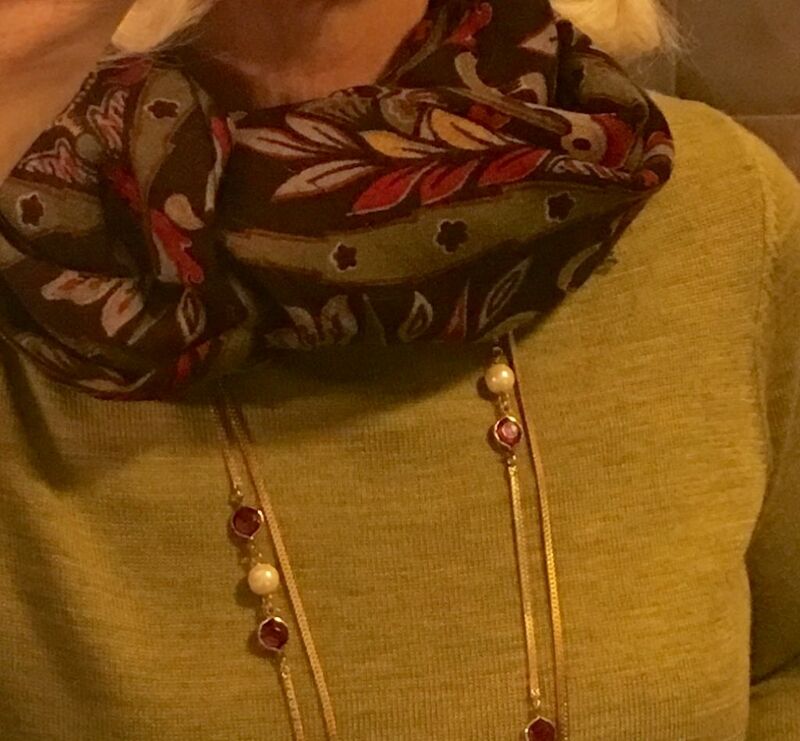 That scarf is beautiful and looks lovely layered with the necklace. Sterling, you are so kind. Yes, this fall I added some olive and burgundy colors and playing with them keeps this 30X30 interesting for me, at least so far. The olive, burgundy and orange that I had seem to work well together and with my winter neutrals, and both olive and burgundy can function as neutrals too. Sal, you are right that the last green sweater is new. At NAS I added an olive coat and olive jeans but then wanted an olive winter top. The sweater showed up at The Rack and I hoped it might work and be a new-to-me color to play with. I am not sure what it's EF name is, but it is not "olive". Brooklyn, thank you. I have made bone my light neutral and collect it when I can. I am glad that you think the boots work with the skirt. They are ECCO and a dark brown. I thought I had a find, but need to look for one or make one. They are several years old now. Thank you, Katerina and tanstaafl, my scarves are my secret weapon to pull things together. In this case I didn't think the bag was my best choice, but I needed something big enough to carry books and a play script to meetings. This one's size worked best but is more taupe than brown. Wow, you look so elegant in white!! I love that tonal ensemble. I do see what you mean about the burgundy boots -- they look like jeans-boots, not skirt-boots, to me. LOVING the White Out. KILLER. I love the white out, you look so lovely on that, definitely your color combo any time. Your WIW never disappoints. Christening outfit is WOW! Thank you each, for looking and commenting. It is so helpful. It looks like the christening outfit was a success. A "Killer"! I can't wait for an occasion to wear it again. Today I am wearing some of my oldest EF pieces, but so far so chance of getting a photo. The top and pants are both a soft merino wool in charcoal. I paired the outfit with EF taupe loafers and a taupe bag and a scarf that evokes leopard, also dark pearls.